You'll be £10.39 closer to your next £10.00 credit when you purchase Struggle and Suffrage in Windsor. What's this? 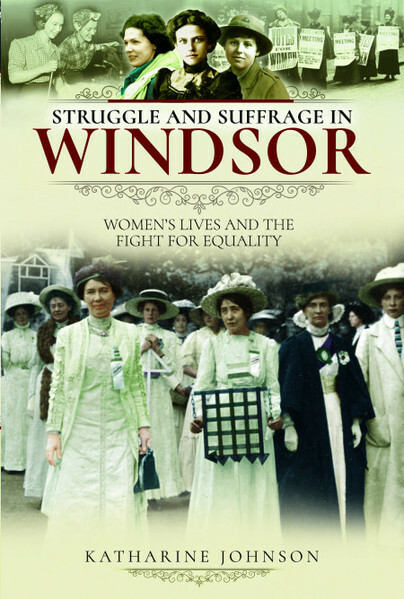 Windsor’s role in the women’s suffrage story is a fascinating one and yet has received very little attention. At drawing room meetings, debates and rallies suffragists fought not just for the right to put a cross on a ballot paper but so that they could help put an end to some of the shocking injustices women faced, some of which were especially felt in Windsor at that time. From Queen Victoria to Princess Elizabeth, the women of Windsor have played a major role in shaping this country. But what of the lesser-known women? The untold and often intertwined stories of the rich and famous are brought together with those of domestic staff, nuns, nurses, school teachers, mothers, shopkeepers, beggars and prostitutes who all played a part in a century of extraordinary social changes. What was it like to be a female resident of the workhouse? Or the lady who founded a home for destitute women and the ‘fallen women’ who lived there? The lady who allowed her home to be used as a hospital in WWI and the nurses who worked there? For those who lived in the cholera-infested Victorian slums and the women evacuated to Windsor with their children during WWII? And those who campaigned tirelessly to improve women’s rights and get the vote? This book provides a fascinating, behind-the-scenes insight into women’s lives above and below stairs in this unique microcosm of Britain. After gaining an MA in History at Cambridge University, Katharine Johnson trained as a journalist, specialising in home and lifestyle magazines and contributing regularly to Berkshire Life. She has lived in Ascot, near Windsor, for nearly 20 years and is the author of three novels. When not writing, she can usually be found with her nose in a book, being a room guide in a historic house or walking her dog in Windsor Great Park.